Welcome to our final day of the Inspire Leggings SewAlong! If you don’t have your pattern yet, you can get it here. Today is the LAST day for the leggings SALE, so be sure to grab your favorites before they go back to full price (aff link). Day 4 is HERE on the blog, with a guide to walk you through sewing your waistband and hem! I hope you’ve enjoyed the process of sewing along with the group- I’ve certainly enjoyed seeing all the new creations that have popped up this week! Because nothing ever goes quite as planned, I’m giving you all a few more days to finish up (or start and sew another pair of) your leggings before I choose a winner for our prize. Remember, every finished pair counts as an entry! If you’re joining me after the event (what we call an “On Demand” Ride in pelo-talk- yes I’m totally addicted to my new Peloton), feel free to browse the videos, and drop me a line if you need any help! While we’re waiting, I wanted to share a special Pinboard I’ve put together for you with various hacks that are just perfect for the Inspires, Strides, Super G’s or Lucy Leggings- there’s everything from new ways to use mesh to adding big front pockets to your leggings! 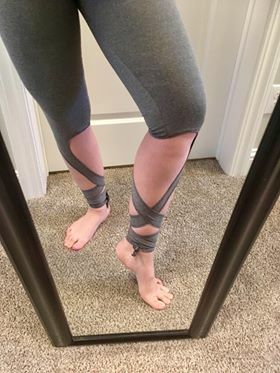 Our own Kayleigh Landon put together a gorgeous pair of ballet leggings that make me want to rush into my sewing room and copy ASAP! Keep an eye on the Greenstyle blog for a tutorial coming soon! If YOU have a favorite leggings hack that you don’t see represented in my board, please drop a link below, and I’ll try to add it! There’s almost an endless variety, and a little (pin)spiration never hurt anyone! If you’ve enjoyed this event and want to stay in the loop for future SewAlongs, you’re welcome to subscribe to my blog or follow me on Instagram! Happy sewing! Mine will be later. I have to get some fabric first. I loved your sew along.